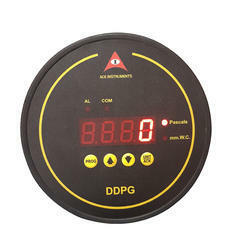 Pioneers in the industry, we offer differential pressure gauge, differential pressure indicator (ai-dp1-1) and portable differential pressure meter from India. 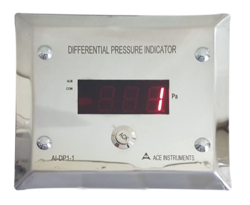 Differential Pressure Indicators manufactured by Ace Instruments are high accuracy instruments with integrated display & 4-20mA Analog Output. The differential pressure indicator has a 4 digit red L.E.D. Display of 0.5" Height with 0.1 mm.W.C. or 1 Pascals resolution. Industry standard 4-20mA Analog Output is available as standard output. Optional RS485 Modbus Output is also available for connecting to BMS/SCADA. Ranges available are from -10.0 to 10.0 mm. W.C./ 0.0 to 10.0 , 20.0, 50.0, 100.0, 25.0, 500.0, 1000, 2500, 5000 & 10,000 mm.W.C. The differential pressure indicator is provided with selectable units of mm.W.C. & Pascals selectable from front "UNIT" key. Any other standard metric unit can be accommodated including cm. W.C., In. W.C., In. Hg., mm. Hg. Integrated buzzer alarm for process violation is a standard feature with option of Enable/Disable Alarm with alarm delay time programmable. Customized measuring ranges can be provided as per requirement. Differential Pressure Indicators are extremely useful in pharmaceutical Laminar Air Flow Cabinets, clean rooms, Air Handling Units, Hepa Filters, Filters, Bag Filters, pharma machinery, Biosafety Cabinets, Laminar Air Flow Units, HVAC etc. Differential pressure indicators come in Aluminium LM-6 Body with Integrated High Speed Sensor with an accuracy of /-0.5%F.S. & 40 mm. depth & fits into industry standard Mounting Holes like the Analog Magnahelic Gauges. Customization is possible for quantity orders. Pressure Range -10.0to + 10.0 mm.W.C./-25.0 to +25.0 mm.W.C. / -50.0 to +50.0 mm.W.C./0.0 to +100.0 mm.W.C. Applications Hospitals,Pharma clean rooms etc.. Differential Pressure Indicators manufactured by Ace Instruments are digital readout differential pressure gauges suited for application in laminar air flow cabinets, clean rooms, biosafety cabinets, AHU, etc. Differential pressure indicators are part replacement for the analog magnahelic® gauges & are easy to use with clear 4 digit led display. It comes with built in sensor & also a buzzer alarm with acknowledgement facility for process violation alert. Salient features include unit conversion at the press of a key between mm.w.c. & Pascals, integrated buzzer alarm for set point violation, offset provision io meet audit requirements, analog 4-20ma output, 30 mm. Depth for clean room modular wall fitment & RS 485 modbus communication for BMS / SCADA / PLC integration. Portable Differential Pressure Meter helps to carry out differential pressure measurements at air conditioning system filters or air flow measurements in ventilation ducts using a pitot static tube. 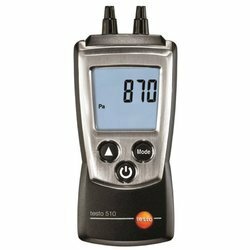 Differential Pressure Meter measuring instrument is ideal for field installation and maintenance work in and around ventilation and air conditioning systems. The optional pitot static tube allows you to measure the air flow in ventilation ducts from 10 to 100 m/s. Aerosense make Differential Pressure Gauges are extensively usedfor measuring the differential pressure in pharma clean rooms, HVAC applications, pharmaceutical machinery, Pass Box, etc. 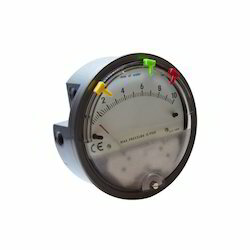 Differential pressure gauge have two inlet ports, each connected to one of the volumes whose pressure is to be monitored. In effect, such a gauge performs the mathematical operation of subtraction through mechanical means, obviating the need for an operator or control system to watch two separate gauges and determine the difference in readings. ± 2% of Full Scale. Looking for Differential Pressure Indicators ?